Discount dental plans. Affordable individual and family plans. An affordable alternative to dental insurance. Compare up to 30 national and regional discount dental plans FREE by entering your ZIP code in the DentalPlans.com box, or click here. Enter your ZIP Code above to compare and choose from more than 30 discount dental plans — FREE. Choose a discount dental plan as an affordable way to help cover the costs of dental care. Many people looking for cheap dental insurance have found discount dental plans to be a good alternative to dental insurance that allow you to save money on most dental care services. When you join a plan, you'll receive a membership card that you present to participating dental care providers. You pay the dentist directly at a discounted rate. With dental insurance, you typically pay premiums, deductibles and co-pays or coinsurance. A discount dental plan only requires a low, annual membership fee to join. Individuals, families and groups can sign up and start saving immediately. There are no health restrictions or tedious paperwork to submit. Also with dental health insurance, you may have a waiting period before your benefits kick in. Or you may have to satisfy a deductible before the insurer pays the dentist. With a dental discount plan, you can start using it right away as most plans activate within three business days after you join. This makes it an attractive option for students who find themselves no longer covered by their parent's insurance, or people who have lost benefits because they are unemployed. 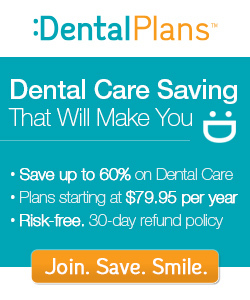 If you already have a dentist, check to see if he or she participates in one of the discount dental plans offered through DentalPlans.com.